A few years ago, the unthinkable happened – Sega announced that Mario and Sonic were to put aside their 16-bit rivalry and join forces in an officially licensed Olympic game. Clocks ran backwards, dogs barked uncontrollably in the street and the whole world lay in danger. Then we played it, and saw that it was good, and the dogs did stop barking and the clocks did return to their regular rotation. It also turned out to be Sega’s biggest-selling title since 1992’s Sonic the Hedgehog 2, selling over eight million copies on Wii and four million on DS in two years. So this time, when Sega announced the follow-up to be based on the Olympic Winter Games, everyone accepted it like the 1990s never happened. 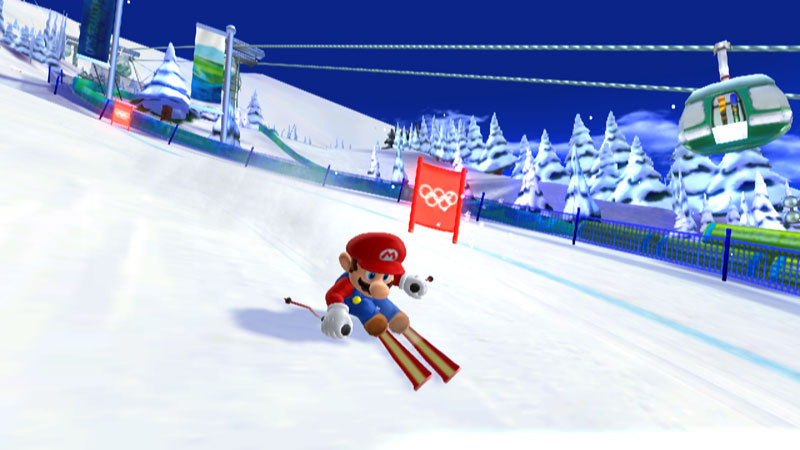 Despite this seemingly unstable universal balance, Mario and Sonic at the Olympic Winter Games is proof that, like peanut butter and jam, some unnatural combinations can be outstanding. The main criticism that could be aimed at the first title was the abundance of waggle controls. Granted, track and field events require a great deal of running, but after an hour most gamers were left sweaty and sore from the Remote exertion. Thankfully the nature of the Winter Olympics reduces much of the need for waggle – in most events you’re going downhill fast with something strapped to your feet, or are otherwise on an icy course with skates, runners or other friction-limiting apparatus. What this translates to is a bare minimum of waggling, other than for brief periods at the start of some events (Bobsleigh, for example) or to gain speed on short track events. The decision to pare down the waggle means you can now play comfortably for as long as you like, without suffering from Pole Vault Arm in the morning, and that's one of the biggest boosts to this second sporting outing. As a rule, the controls rely a lot more on tilting and turning rather than shaking. Like the first game, Nunchuks are completely optional, although they do seem to help in some of the skiing events by giving the feeling of holding both poles. To steer your character in any of the downhill events, you hold the controllers vertically and tilt them from side to side to steer, tilt forward to accelerate and pull them back to brake. It’s a control scheme capable of the required subtlety in some of the harder courses, although it is sometimes difficult to pull off big turns and brake at the same time. For the skeleton and bobsleigh you’re supposed to hold the Remote to your chest and tilt your body left and right to steer around the course, and although it’s unnecessary it certainly gets you “in the zone” for these events. The controls are pretty good overall, lending a pleasing delicacy to some of the race events, although there are some problems when it comes to performing some of the advanced tricks that ask you to draw circles, spirals and hearts in the air – it’s sometimes tough to tell when the input period starts, leaving you frantically drawing multiple shapes in an attempt to pull it off. Failing an advanced trick on the snowboard and ski cross courses costs precious time, and although attempting them is by no means compulsory it’s still disappointing to fail due to inconsistent controls. Each sport usually only needs a few inputs, making them as user-friendly as possible, although they each have their own quirks. Figure Skating asks you to flick the Remote up, down or twirl it around to perform tricks, Curling gets you frantically brushing the ice and Ice Hockey can be played with the Remote side-on, with to pass and a shake of the Remote to shoot. You’re never overwhelmed by the controls and if you play through the Festival Mode you’ll get introduced to the different setups before you’re thrown into competition. 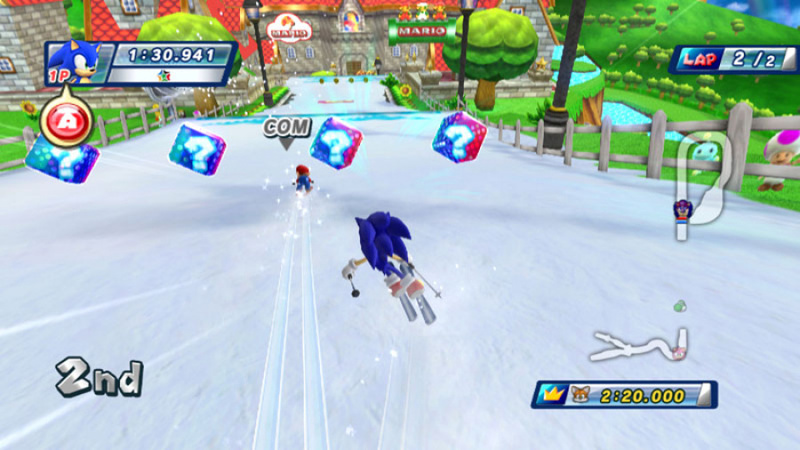 One of the main draws for the Winter version is the vastly improved number of Dream Events, which put a Mario and Sonic spin on some traditional (ski cross and snowboard cross) and non-traditional (snowball fight and hang gliding!) sports. On the whole these events are excellent, with most of the race-based modes playing out like Mario Kart on Ice, complete with red shells, lightning and fake item boxes. With only four competitors the races aren’t quite as intense as Mario Kart, but skiing along Seaside Hill or short-track skating in Eggman’s factory is enjoyable in its own right. It’s safe to say there’s plenty to discover for ardent Mario and Sonic fans, and more casual gamers are likely to find the variation plenty engaging too. Bizarrely, the most exciting Dream Event by far is the Dream Figure Skating. Picking Mario World or Sonic World, you take a team of four skaters onto the ice to play through classic scenes from both games: Mario World sees you stomping Goombas and collecting Stars, whereas Sonic’s stage begins in a 3D Green Hill Zone before moving through Sonic the Hedgehog 2’s Death Egg Zone (its first new appearance in nearly twenty years!) and onto Perfect Chaos from Sonic Adventure. It’s simultaneously exciting and baffling to see these classic moments played out in an ice skating setting, but somehow it absolutely works and creates a classic gameplay mode that you simply have to play. Rather than reproduce the first game’s Circuit mode, that offered various combinations of events over a short period, the Winter Olympics gives you Festival mode, a recreation of the whole Olympic spectacle. Between the opening and closing ceremonies you train and compete in a range of events, earning points based on your positions and overall accomplishments. Every few days a rival will appear and challenge you to an event, and you have to defeat them to proceed – if you lose, it’s back to the rival intro screen to take them on again. Not that you’ll need to retry that often, as most of the rivals are pretty easy to overcome, a fault that could be levelled at the Festival mode in general, to be honest – you will win it on your first try if you’ve ever so much as picked up a Wii Remote before. There’s plenty to do after conquering the Festival mode though; in fact, that’s where the real challenges commence. By spending your Star Tokens in the Shopping mode you can unlock King Ghosts (think staff ghosts, only wearing crowns), Blue Coin challenges and more, and completing these unlocks even more content. Sega has clearly learnt from the lack of longevity that dragged down the original Mario and Sonic Olympics, adding layer upon layer to the sequel to bring it more in line with Nintendo’s best output. In fact, all through you’ll spot elements of Nintendo’s design ideas: when you unlock an emblem, you gain a hint for the two emblems next to it like the trophy room in Super Smash Bros. Brawl, and the King Ghosts are straight out of Mario Kart. It’s a much more collaborative title than the first, and it elevates the game far above its predecessor. There’s also stacks of extra content to buy with your virtual dollars, with Olympic trivia, classic and remixed Mario and Sonic tunes and decals to customise your bobsleigh, skiis and snowboards. You can also buy a huge range of clothes to customise your Miis, with pumpkin heads, Goomba t-shirts and Santa suits on offer, but the real draw is the full body suits that let you dress your Mii as Bowser, Sonic, Dr Robotnik and many more. Considering there are no unlockable characters, it’s a great idea to be able to put a suit on your Mii and take on new abilities – your Mii in a Sonic suit runs as quickly as Sonic himself, for example – to broaden the character list, so if you’re upset your favourite character isn’t on the main list you may be pleasantly surprised at who’s available in the Boutique. Presentation-wise, Mario and Sonic at the Olympic Winter Games is head and shoulders above 90% of Wii titles. It may not have the graphical variation of the Summer Olympics, but the snow effects are nicely realised and all the characters are well modelled and animate brilliantly. Seeing some of your favourite Mario and Sonic moments alive in 3D in the Dream Events is well worth cost alone, and the music is similarly excellent throughout – classic Nintendo tunes are remixed, some for the better (Super Mario World’s ground theme sounds great) and some for the worse, with Good Egg Galaxy receiving a cotton-eared re-recording. The main theme may be uncannily similar to Sonic Unleashed’s theme tune, but the recordings on the whole are outstanding and the variety is second-to-none. Hearing your favourite classic tunes in the Figure Skating is a genuinely joyful moment, and the sound effects and voices are every bit as good. Sadly there are a few problems that prevent Mario and Sonic at the Olympic Winter Games from being the only must-have sports title on Wii. Pulling off the more advanced tricks is sometimes more a matter of luck than skill, and although the controls on the whole do a fine job you do find yourself wishing for MotionPlus in some events. 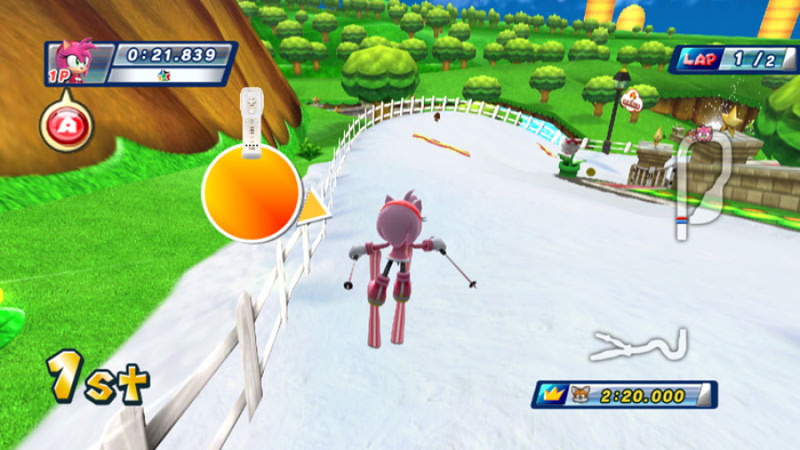 The Balance Board controls can also be a little hit-and-miss – the ski jump isn’t as responsive as Wii Fit’s version, and if anything the board’s use is often less accurate than the standard Remote and Nunchuk set-up, which does a fine job of controlling the sports in general. The lack of WiFi Connection play is also a bit of a letdown, and although this is one title you’ll happily play with your friends and family a bit of Internet-based rivalry would have spiced it up all the same. 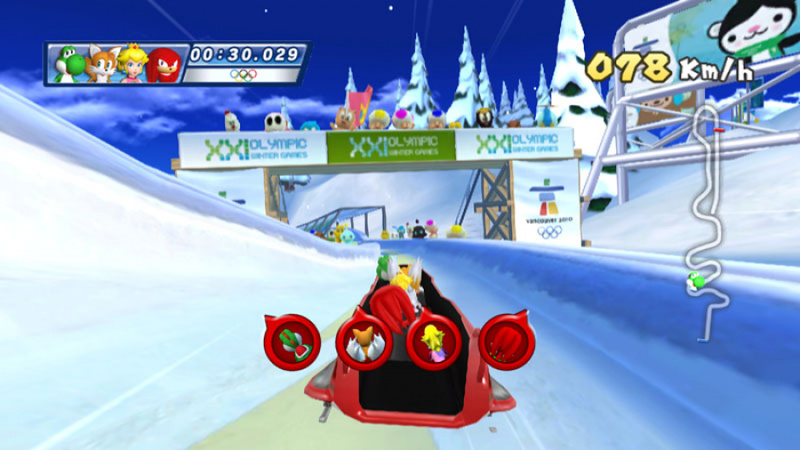 You can still share records and times with other players online, but the implementation is disappointingly slow compared to the online leaderboards in Mario Kart Wii – each event must be downloaded individually, sometimes taking twenty or thirty seconds to load up a single page of times, and if you want to see where you’re placed it’s another thirty seconds to download your data. What should have been a quick and engaging way to keep you bettering your scores turns into a bit of a chore. That’s really all the criticism you can fling at Mario and Sonic at the Olympic Winter Games, though. 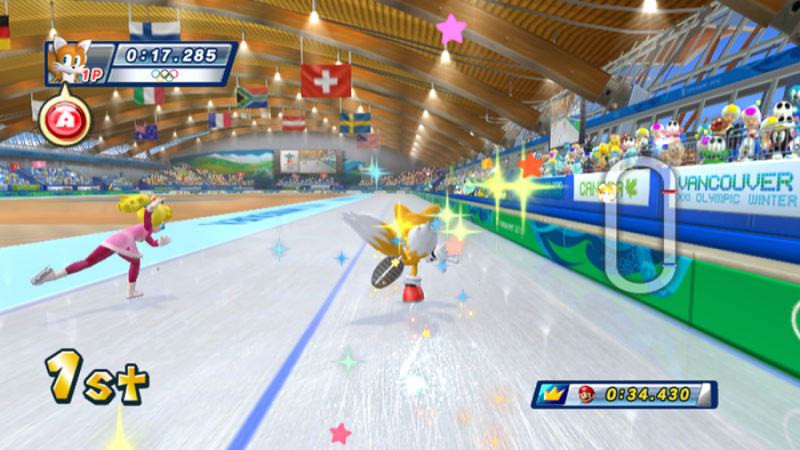 Sega has truly listened to the feedback about the first game and slimmed down the waggle controls, beefed up the lastability with a ton of extra content and managed to turn even the seemingly dull events of Curling and Figure Skating into engaging and varied games. With over twenty characters, twenty-five events and hundreds of unlockable items, you’ll be playing this game well into the New Year, and the added subtlety of the controls makes playing it a far less tiring experience. It may not have the control genius of Wii Sports Resort but it’s every bit as good in terms of content, presentation and pure, distilled fun. Oh my goodness. I'll definitely be checking this out. Amazing review, Prosody. This is back on my radar, having been knocked off by reading reviews elsewhere. Yes, shame on me. With no Rabbid mini-game fest for this Christmas, it's good to know this will provide some good old drunken fun in it's place. Can't wait to try curling. This will be the fourth game I buy in 2010. 9/10? Wow, certainly glad I ordered the game a couple of hours ago. I noticed that IGN gave it a 6.5. A 9!? Wow, maybe I wiil buy this. I'm glad to hear there is very little waggle in this game, the first one had too much. I plan to pick this up tomorrow. @Corbie: So did IGN AU, and we know what they are like. Miserable sod's. Now how about you give us reviews for Spyborgs and TMNT Smash-Up? Better than I expected, though the tagline made me throw up in my mouth. Almost makes up for the fact that Gravatronix was such a disappointment. Great review @Prosody with a superb intro. I'm with you, it was an epic gaming collaboration in 2007. I played the original Mario & Sonic at the Olympic Games alongside Wii Sports as an unsuccessful way of getting some sort of exercise! I'll still get this one, even if it involves less physical interaction, mainly to check out the characters in its Winter setting, to huddle around the Wii for party multiplayer and its masses of content. Will I miss out on this one if I don't own a balance board? @JamieO: No, you'll actually have a better time NOT using the balance board. Total gimmick IMO. @Corbie: IGN gave it a 6.5?! Goes to show you how biased they are against Nintendo. IGNorant little b*stards. This was on my list until I read the IGN review. Totally back on the list now. Anyways, I really want this game, anyone know when it comes out in the US? Wow, didn't see that one coming. Reviews of this game tend to be in the 6-7 area. But I really loved the first game, and this seems like this one improves upon the first. I'll check it out when there's a price drop. Metal Sonics is in this booya! Interesting... still the IGN score does seem low. I'll be waiting on some other reviews to see which way this is leaning, although I did enjoy the first game. Might get this sometime next year. Theres other games Im interested. great reveiw prosody. No online = no online play. Can't they just get add online play? 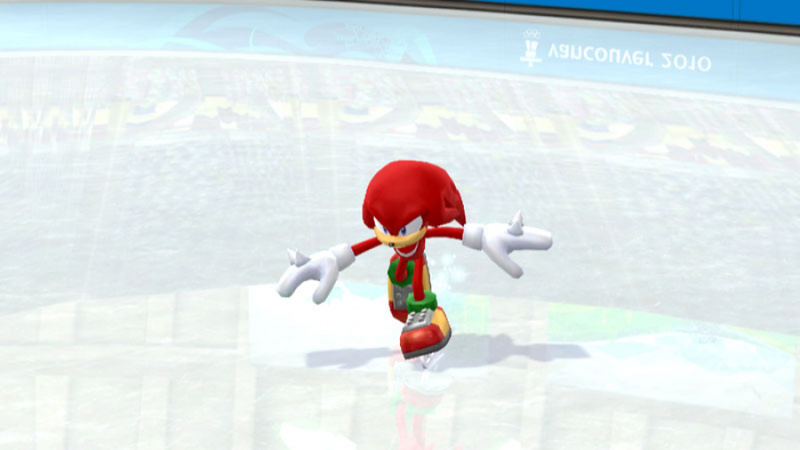 There is no way I'm buy another Mario & Sonic at the Olympic Games game until they put online play in one game. great review! IGN on the other hand had mostly a criticizing review.well why have someone who doesn't like a certain type of game review that type of game in the first place? thats what i dislike about IGN. I liked a lot the last Mario&Sonic, so this is an obligatory to buy and play with my friends. The bad point in the summer olimpics was the fact you get a record in multiplayer and it doesn´t count to the records. Only the 1 player was saved. Too bad. I hope this don´t have that terrible problem. I really enjoyed the original, and thought that had a decent amount of content to do. This sounds like it has even more. I think more highly of Nitnendo Life than i do IGN, so I'm probably going to pick this up after I play through Wii Sports Resort a bit more. Good read, but try and be a bit shorter, probably have people read more of it. Just a thought. Wow, read some of the comments on IGN. What a bunch of fanboys, jesus. I was worried I'd wake up to a backlash of fanboy comments directed at me, but I'm glad to see that's not the case! The truth is, this game delivered everything I wanted - loads of replayability, great controls and some great Mario and Sonic-themed titbits. I totally agree that the Balance Board is unnecessary - it's only available in single player for a start, so you're not missing out on a lot. There is an Adventure Mode in the Wii version? Or it's only on the DS Version? Nope, no Adventure mode in the Wii version - it gets Festival mode instead. Looking forward to playing the DS one though! Great review Prosody, I'm glad NintendoLife gives a game like this two thumbs up, cos to my mind it's games like this that the Wii is all about. I can't wait to play it multiplayer, I know everyones gonna love it. Also don't know why a 'senior' detracts from the review by bringing up the ign review. How is that relevant? Loads of other respected reviewers supported the game like Prosody has, like Eurogamer for example gave it an 8/10 and they're really tough on Wii games. Interesting how different the opinions of the IGN reviewer and James are. 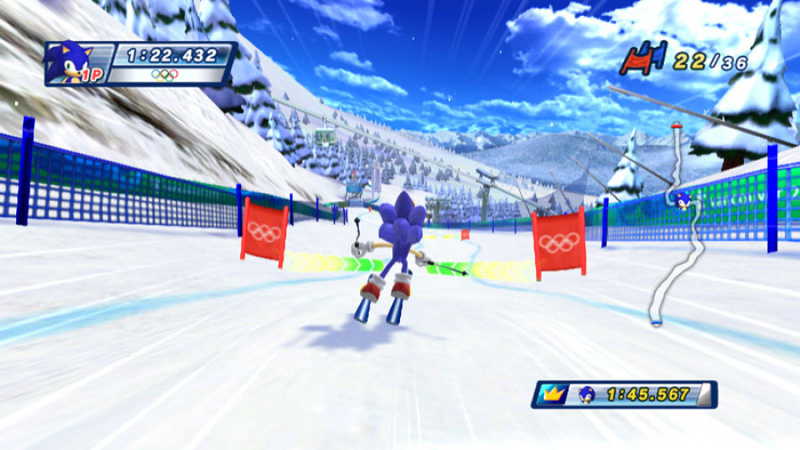 Metal Sonic on skis. DO WANT. EDIT: "Mario World sees you stomping Goombas and collecting Stars, whereas Sonic’s stage begins in a 3D Green Hill Zone before moving through Sonic the Hedgehog 2’s Death Egg Zone." Want even more. I'm glad the reviewers on this site actually appreciate a fun game. ONM gave it a 90% as well. Loved the original will almost definately love this. IGN gave a Boy and his Blob a 7.6....ridiculous, the game is fantastic, I'd personally nail it in the high 8's. Nintendo Power gave it an 8.5. I dont trust IGN for reviews that much anymore, they're great and everything on the Nintendo side...but eh. Mega Man 9 got an 8.7! ?...It's a 10 in my eyes as well as Wario Land Shake it!. You know what's funny? 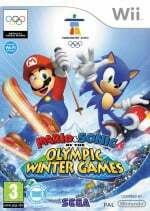 IGN gave Mario & Sonic at the Olympic Games (the original) a 7.9, and the general consensus is that the sequel is way better. I rented this game, and this is a perfect score. I headed straight for Metal Sonic. The events are really fun, dream gliding not included. A must have for any self respecting Wii owner. Picked up today, game is indeed quite awesome. Need to try multiplayer. Anyone in the UK a heads up, Morrisons are selling this for £18.99. Whether this is a limited deal or not I don't know but it's the cheapest i've seen it. Played the frack outta this game over the weekend. That is, the family and I. Wonderful game! Essential if you are a Wii owmer IMHO. The dream events are superb and the balance board playability is second to none! I'l Get this game After New Super Mario Bros Wii the reason for now i have only cash for one game. just wondering, will you guys ever do video reviews? I really liked the first game, but was unable to play most of the dream events due to the fact that I had to return it within a few days. Hopefully I'll get to the dream events in this game. Excellent review, Prosody. Also, to add an IMO to the topic of IGN reviews, there are video game reviews, and there are video game reviews. IGN, for me, is the former, and NL is in the latter. However, I know that there are people who like both IGN and NL. For me, the trick to seeing if a game is truly worth it is to create your own mini-Metacritic of 3 or 4 review sites and use those scores to determine if you like the game (I've also grown fond to Thunderbolt and Nintendo Power). If you don't like IGN, ignore it (like what I mostly do), but don't torch it, since there could be "fanboys" that could easily torch NL if they wanted to. Balance board is great in snowboard cross, alpine skiing, and ski cross. Love Mii customization. I Played it, there's really no point in using the nunchuck or Balance board, but they're still fun to use. I'll have to check more of this out. This is the best Mario and Sonic Game I've played, it has impressive controls for its game, fun multiplayer and a lot more. I agree with the review. 9/10. Without a doubt a excellent sports title.